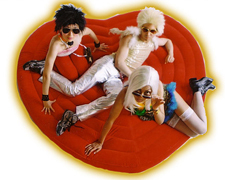 Weekly Entertainment Guide – Liberté! Egalité! Fraternité! 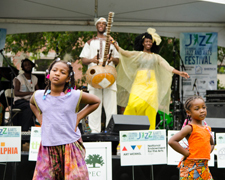 The Oval, the “Park on the Parkway” partnership between the Fairmount Park Conservancy and Philadelphia Parks & Recreation, kicks off another summer of free outdoor fun on July 15. 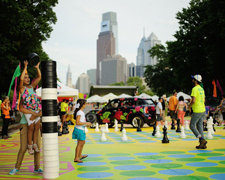 Programming, events, and activities for all ages will be held Wednesdays through Sundays with live musical performances, pop-up beer garden, interactive arts and culture activities, fitness and wellness activities, movie nights, beer gardens, food trucks and more, including a 25,000 square foot ground mural by the City of Philadelphia Mural Arts Program, through August 21 with special DNC week events, at Eakins Oval in front of the Art Museum stairs, Benjamin Franklin Parkway & 24th Streets, Philadelphia. Photo by Albert Yee. 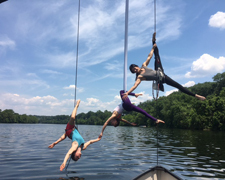 Invisible River, a performance journey on the Schuylkill River, returns to Fairmount Park this weekend with two special events: Beck Epoch, an aerial exploration of swinging, swimming, swiveling and suspension from the Strawberry Mansion Bridge, Friday, July 15 and Saturday, July 16, 7:30pm, near 2200 Kelly Drive. Watch from the banks of the river or rent a canoe or kayak. 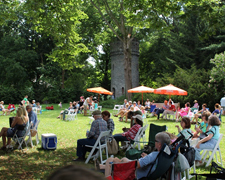 The Schuylkill River Arts Day, Saturday, July 16, 10am-2pm, offers a festival for all ages with dance and circus performances, interactive activities on and about the river, food, and a processional starting at Mander Recreation Center at 33rd and Diamond Street to the riverfront on Kelly Drive with music and dance by the Kulu Mele Dance Company. Free. Invisible River aims to celebrate the importance of waterways through the act of live performance, advocacy and educational outreach programs. Photo courtesy of Invisible River. 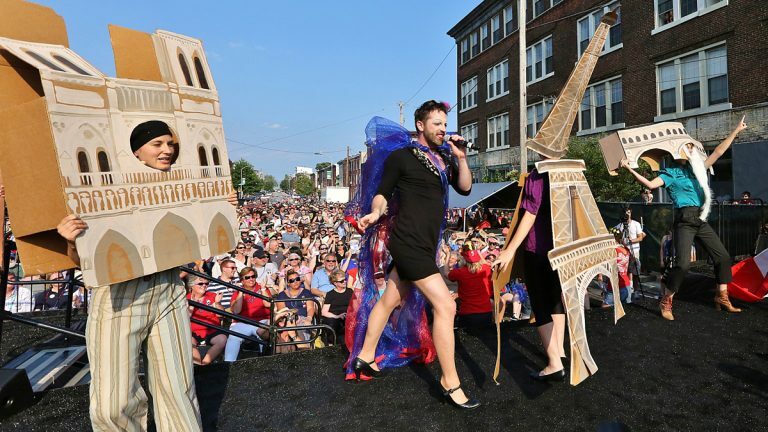 Put on your best 18th century French peasant clothes and join the 22nd annual Bastille Day Block Party, this Saturday, July 16, beginning at 2pm with a French Family Carnival in the Fairmount Neighborhood of Philadelphia. 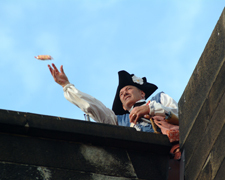 Eastern State Penitentiary teams up with the experimental cabaret troupe, The Bearded Ladies, once again to present the entire French Revolution in a spectacle of song and dance all culminating in a playful re-enactment of the Storming of the Bastille at the historic prison at 5:30pm. Dozens of French revolutionaries will capture Marie Antoinette and, ignoring her mocking cries of “Let them eat Tastykake!,” will drag her to a real, functioning guillotine as more than 2,000 Tastykakes are flung from the prison’s towers. The performance, as always, is free and open to the public, with exclusive VIP seating available. Then, dancing in the street with the West Philadelphia Orchestra, French-themed entertainment, as well as twilight tours at the penitentiary, 22nd & Fairmount, Philadelphia. Liberté! Egalité! Fraternité! Photo courtesy of Eastern State Penitentiary. *** UPDATE – The Philadelphia Bastille Day Celebration continues as planned. “Our thoughts are with the victims of the attack in Nice. Traditional Bastille Day is a celebration of freedom and unity. Our version adds a loving parody of French culture. 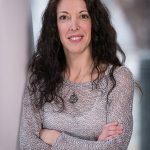 These are two good reasons to keep our plans to celebrate on Saturday,” Ellen Feist, Eastern State Penitentiary. 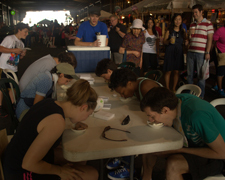 Reading Terminal Market’s Sidewalk Sizzle & Ice Cream Freeze returns Saturday, July 16, 10am-4pm, offering special foods from a selection of market merchants including kabobs, grilled shrimp tacos, ribs, bratwurst, Cajun burgers, turkey legs, grilled gelato sandwiches, grilled fruit sundaes, and ice cream eating contest (pictured) along with live music and more, outside the market on Filbert Street. The historic market first opened its doors in 1892 on the site of what had been an open air market from the late 17th century. Admission free and pay as you go. Summerfest Live! 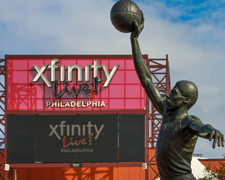 Craft Beer Festival returns to South Philly this Saturday, July 16, 3pm-7pm, with over 150 craft beers, live music all day, and more, XFINITY Live! Philadelphia, 1100 Pattison Avenue, Philadelphia. 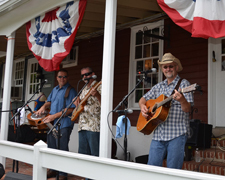 Peddler’s Village hosts its Bluegrass & Blueberries Festival, Saturday and Sunday, July 16-17, beginning at 10am both days with a weekend full of blueberry treats and live bluegrass and country music, children’s activities, and more, Routes 202 & 263, Lahaska, PA. Performers include Ray Owen, Borderline, Mike Brill, Vintage Drive, and Daisy Jug Band. Rain or shine. Photo courtesy of Peddler’s Village. The 4th annual Tie-Dye Music Festival returns to the Community Arts Center in Wallingford, PA, uniting art, music and the community with a free, family event, Saturday, July 16, 2pm-7pm. The afternoon features five local bands including Animus, Beaufort, Out of Order, Matt Wenger and Light Rail, plus vendors, raffles, and tie-dye activities! Bring your own items to tie-dye for $5 or buy t-shirts, aprons and scarves on site with the help of tie-dye guru Bob Deane. Food and beverages available for purchase. Bring your own and set up chairs and blankets on the side lawn of the Center. The event is rain or shine and will be moved inside if it rains and parking is provided, 414 Plush Mill Road. Photo courtesy of the Community Arts Center. 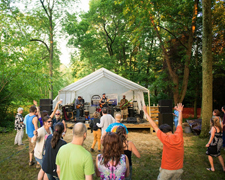 The Shady Grove Music Fest, Delaware’s premier festival for local and original music, is this Saturday, July 16, beginning at 11am with 9 bands including Fiance, Three Man Cannon, Universal Funk Order, The Limits, Camp Candle, and Frisco, in the grove behind Gild Hall, at 2126 The Highway, Arden, DE. Bring a lawn chair or blanket. Food and beverage available for purchase – no outside food or beverage permitted. Children 12 and under free. In the event of rain, performances move to Gild Hall. The Tri-State Caribbean Cultural Foundation hosts the 6th annual Atlantic City Caribbean Carnival Weekend, July 15-16, celebrating Caribbean traditions with events, parties, and the free costumed parade on Saturday, July 16, 12pm-6pm in Pleasantville, New Jersey with a carnival village, live music, beer garden, food and more.The NJ Crab Festival is Saturday, July 16, beginning at 11am, with blue claw crabs, beer garden, vendors, children’s activities, and more including live entertainment along Park Boulevard (in front of the Ice House Restaurant), Wildwood, NJ.Head to Cape May for the 12th annual Celtic Festival at Historic Cold Spring Village, Saturday and Sunday, July 16-17 and celebrate all things Irish and Scottish. 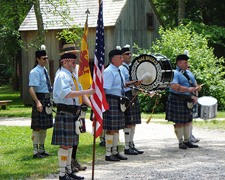 Enjoy musical entertainment throughout the grounds with Nae Breeks Pipes & Drums Band (pictured), Smitty’s Kitchen, Dancers from the Emerald Isle Academy, Joe McGonigle, and Tom Brett. Also, interactive demonstrations, a pub area, children’s activities and rescue dogs to adopt. The Village’s restored, historic buildings will also be open, with historical interpreters demonstrating the trades and crafts of the 1800s, 10am-4:30pm, on Route 9, three miles north of Cape May City and four miles south of Rio Grande, NJ. Photo courtesy of Historic Cold Spring Village. 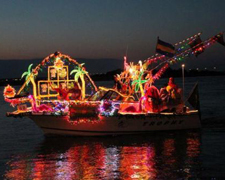 Ocean City’s 62nd annual Night in Venice returns this Saturday, July 16, 6:30pm, modeled after the traditional boat parades in Venice, as owners decorate their boats and parade through the city’s lagoons and back bays, from Longport Bridge to Tennessee Avenue, Ocean City, NJ, with live music, children’s activities and food. This year’s theme is “Destination America,” with Olympic gymnast Nastia Liukin as Grand Marshal. New this year is “Collegiate Cup,” awarded to boats with the best school pride. Admission fee for Bayside Center and Grand Stand Seating is Free. Gates open at 4:30pm. Free parking and shuttle service available. Fireworks conclude the evening at 9pm. Photo courtesy of the City of Ocean City. 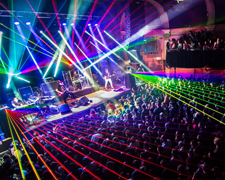 The Disco Biscuits once again host Camp Bisco, three days of music, art, camping and water park fun at the Pavilion at Montage Mountain Waterpark, July 14-16, with the Disco Biscuits (pictured) Odesza, BigGrizMatik (Big Gigantic + GRiZ + Gramatik), Lotus, RL Grime, STS9, Zeds Dead, Hermitude, Jai Wolf, Josh Wink, Keys N Krates, Lettuce, and more, in Scranton, Pennsylvania. Photo by Tim Dwenger.